Festicket, the festival ticketing and travel website, has reworked its platform to provide festivals, affiliates and partners with a far easier way of reselling festival packages on their own websites. The UK-based startup makes it easier for people wanting to visit far-flung festivals but that don’t really have the time or patience to organize everything else that’s needed in addition to the actual ticket. This is where Festicket steps into its own by offering packages that include entrance to festivals, nearby accommodation (which may or may not include food, depending on the package) and access to Festicket’s support lines. For Festival goers wanting to go to, say, Exit Festival in Serbia and Roskilde in Denmark, it’s a time-saver, for businesses it’s an opportunity. 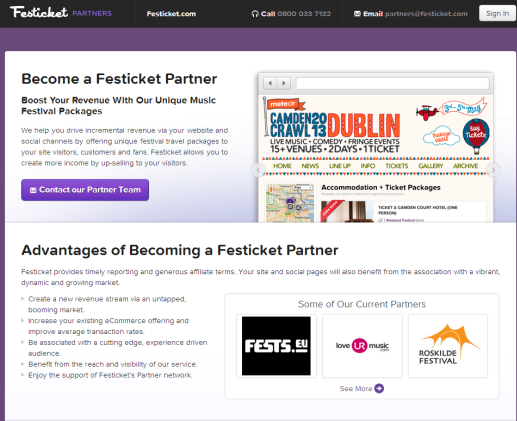 Festickets new “Partners’ Programme” offers a white-label version of the service on their own websites or via their social media channels for a small cut of the fee. While Festicket has offered this option before to festival organizers, promoters and other affiliates, its new platform makes the whole process much easier, allowing the partners or affiliates to set it up themselves. Before, every time a new white-label store was created, it had to be done manually by a team of developers and sales reports also had to be sent out manually. Now however, the reporting process is automated and includes real-time sales data. Affiliate campaigns can also be set up to include tracked links and display banners, giving a better idea of what works, and what doesn’t. Founded a little over a year ago, Festicket is the brainchild of co-founders Zack Sabban and Jonathan Younes that managed to secure €520,000 (around $680,000) in May this year to continue to grow its business. Clearly, it has already put some of that money to work in re-engineering its approach to its business-to-business (B2B) partner programme and is now looking to add more festivals and concerts to its books – it’s already the official travel partner for more than 60 festivals. With its new streamlined B2B offering it should have a good chance of reaching its own goal of becoming the official partner for more than 100 festivals before the end of the year.